Thursday is my Friday – and this was a doozy of a day. Earlier in the week I wrote about The “Name” I Don’t Want to See on Caller ID. Today the school popped up on my caller ID, as I was in a meeting with a table full of people, and this time it was (a version of) the phone call I’d been dreading. My son had a complete meltdown at school. I am still a little unclear on all of the details, but I know he was screaming, and crying, and and really angry. I know his teacher was both confused and concerned by the behavior because it was so uncharacteristic of what the school staff has come to expect of him. I know it was what we had been trying to keep from happening, and yet there it was. I went back into my meeting, but was not productive or helpful. I ran some errands between work and picking the kids up from school. My son came barreling out of the school with his hood up and head down, not wanting to meet my eyes. When I turned him around and walked back into his classroom to follow up with the teacher he was growling at me under his breath. The whole time his teacher was filling me in on how he had handled (not well) the rest of the day, he kept his back to us and mumbled under his breath. As we walked home he kicked fences and hit trashcans while yelling at me that he just wanted to be left alone. I agreed to let him skip both ninjutsu and soccer practice, but still needed to take his sister to both ninjutsu and girl scouts. So I let him stay home, knowing my husband was coming home early to be with him, but could barely focus on my daughter or on the Brownie meeting I had to run because I was worried about my son. 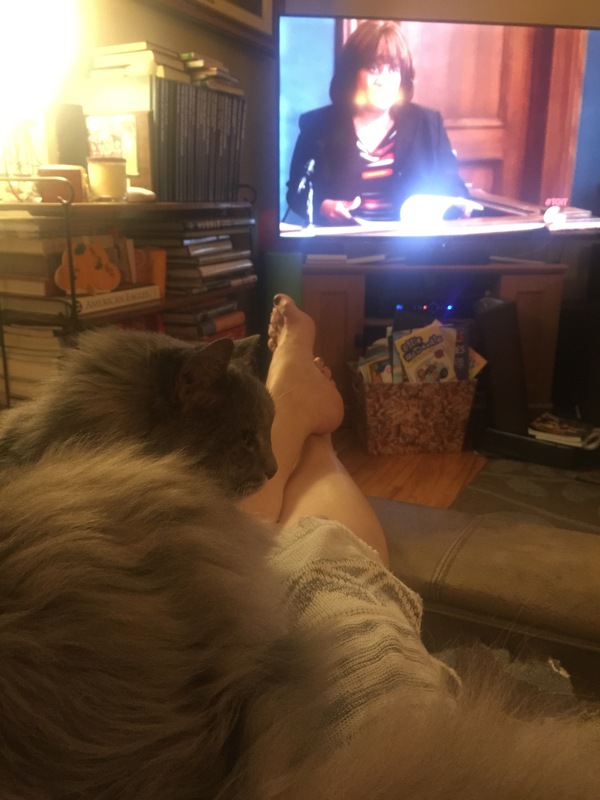 I got through the Brownie meeting, came home got dinner on the table, stumbled my way through showers and bed, and then finally got to the point you see in the picture above..ratty pjs, “therapy” cat and Grey’s Anatomy (on the DVR because my son wasn’t fully in bed until almost 9pm), and a very full glass of wine. Thursday is my Friday, and all I wanted to do was veg. Veg and for a tiny sliver of time not need to think, or worry, or plan, or do anything or be needed by anybody. Tomorrow will come. And tomorrow morning I will need to be a mother to both of my kids. Tomorrow night I will need to be “the president’s wife” and a good hostess at an event for my husband’s management team. Saturday into Sunday will be 24 hours of being a Brownie troop leader at a daytime event followed by an overnight event with the troop. And under all of this will be my all consuming concern for my son. Tomorrow morning will come and I will get up, move on, and do what needs to be done. But for a couple of hours on this Thursday night, nobody needs me. So this is where I’ll be. It doesn’t change the have-to’s of tomorrow and the next and next days but taking care of you is probably the most important thing you can do. I’m so glad you are nourishing you for best version of you who can suit up tomorrow (the next and next). All the love!!! !